I ride my Road King at 653 mph, I do it every day, and trust me, you also do it every day. Actually, we can not call it riding, as we are standing still, at a red light, or in congestion, and still travel at this high speed. 653 mph is the rotational speed of the earth in London, so while we stand still, we actually move quiet fast. At the equator, the circumference of the Earth is 40,070 kilometres, and as the day is 24 hours long, the speed is 1670 kilometres/hour (1037 mph). This decreases by the cosine of your latitude, so that at London’s latitude of 51 degrees, so cos(51) = .629, thus the speed is .629 x 1670 = 1,051 km/h, or 653 mph. I only bring this trivia to your attention as introduction to my real issue, the speed differential, or speed delta. It is not so relevant how fast you ride, but how fast you ride in relation to another reference, this is the critical figure. 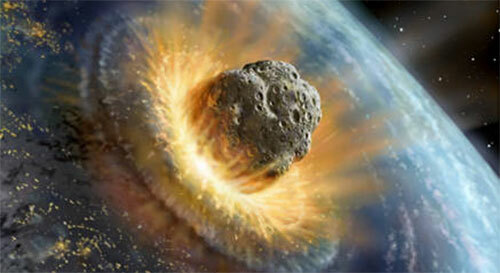 If this difference is high, the danger increases exponentially. In many aspects of our riding we should be aware of the speed differential. Travelling on a country road, the speed differential between you and the big oak tree, is… your speed. The delta is most pronounced in traffic coming towards us, as the speed differential is the sum of both vehicles speeds. My advise, better not touch the truck. But when you travel on a highway at 60mph alongside a truck, you could touch it without great risks. Take the German Autobahn, when all travel at 130mph, all is fine, when however some bimble along at 60mph, and others are allowed to travel at 130mph, greater care must be taken, and some basic rules should be observed. The practise of Undertaking becomes a lethal threat, as participants sharing the road are moving at substantial different speeds, and different speeds best stay in their assigned lane. So, if in the UK we all ride at the same speed limit on a free M25, it doesn’t really matter if we do this at 70, 80 or 90 mph. But in the city, when cars at 30mph meet cyclists at 10mph and pedestrians at 3mph, the food chain becomes clear and the problems start. It is not the speed itself that matters, it’s the speed differential. To avoid a collision, you need to do is bring your speed differential to zero, not your speed. Same applies for filtering. Riding at 50mpg through long lines of stationary cars is dangerous. One dreamer moves over or open his car door, you are doomed. But doing this when the cars move at a snail speeds of 30 mph is much less risky, because the differential now is just 20 mph. You can break easily and quickly reduce this speed differential to zero, eliminating all delta, coming to a virtual standstill against the moving cars. Here in the UK, the 2013 Road King 110th Anniversary Edition is more special then in the US. My international reader may wonder what can be more special then special, and more limited then limited, so let me explain. From a US point of view, the 2013 Road King 110th Anniversary is limited, has a special paint scheme, some badges and dual colour seat, but otherwise it is a Road King of which tens of thousands are sold every year. Lets say the 110th Anniversary Model is a bit special in the US. 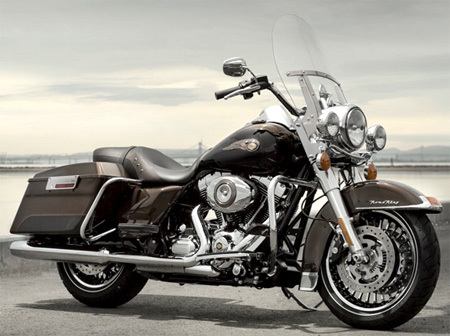 Here in the UK however, Harley-Davidson does not sell the “Road King” at all, it only offers the “Road King Classic”. I am not sure exactly why, but also in the car business you often see that cars sold overseas and far away from its production base have much less variations then in their home market. On the Road King, some elements, like Security System, ABS and Cruise Control are optional in the US, while in the UK they all come as standard. 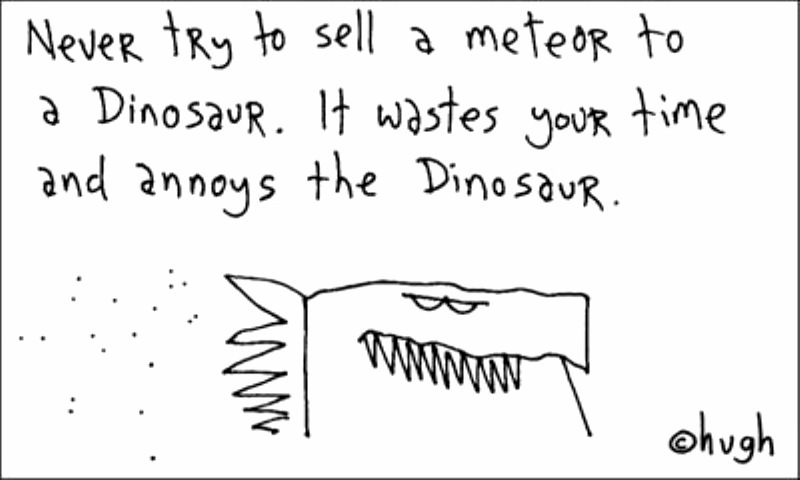 The reason is simple: logistics, its all about shipping, local warehousing and client friendly delivery time. Milwaukee may be happy to ship 10.000 Vivid Black Road King Classics to Europe, as it knows it will sell them, but 4 optional variations mathematically yield 24 different models, and the demand within these 24 variations is much harder to predict. To only produce after the client has ordered is not a good option, as the shipping from the US to the UK and Europe takes too much time if performed economically. Therefore the first thing your kind Harley salesmen in Europe does is to look what stock is there in the larger european warehouses in Oxford (UK), Morfelden-Walldorf (D) or Arese (I) or in the decentralised but networked local dealers, then he checks what is already build and on a ship on its way. So, for the UK, a “basic” Road King is very special, double limited, as the FLHR was last sold in 2009. 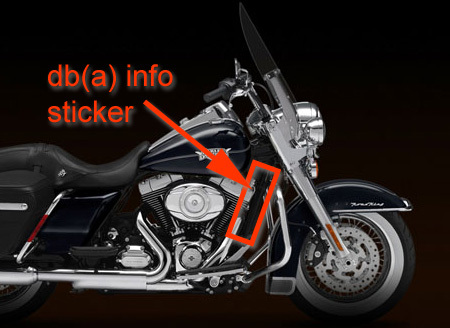 And the differences between a Road King and a Road King Classic are optically substantial. They share the same frame, the same 103 Ci engine, handlebars and screen, but they are very different in two main parts: the saddlebags and the wheels. 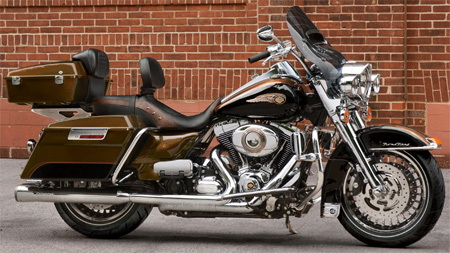 Check out the difference between a Road King and a Road King Classic. The Classic on the right has black leather saddlebags, classic look, but not so easy to use use, and no real locks, just clips. The Road King (left in 110th Anniversary Vintage Bronze) with its hard saddlebags in the same color scheme as the bike, also have a very classic look, as they are shared with most other Touring models. 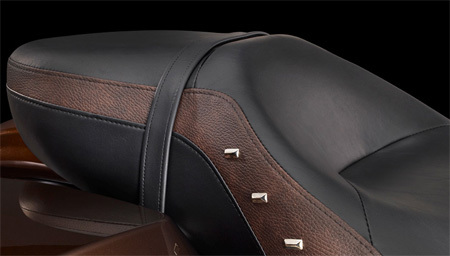 Easy access and lockable with the same key as the bike, I am very much looking forward to this new luxury. The other big difference are the wheels. Just looking at the front wheel, the Road King Classic has 16 inch front rim, laced, with white band 130/90 tyres, while the Road King has a 17 inch 28 spoke cast rim, which I hope are easier to clean. What the handling difference between 16 and 17 inch rims will be has to be seen but may well be very small, as the whole geometry should not be affected. The 16 inch wheel takes 130/90 tyres and the 17 inch wheels 130/80 tyres. This means the (rubber) tyre are not as high (80% of 130 cm), but the overall wheel radius is pretty much the same due to the bigger 17 inch rim. I think the spoke cast looks cleaner, the brake rotor smaller, although its the same size. Some Chapter memebrs do not believe me, but my friendly Harley dealer can confrim that I did 20,000 miles on my first set of factory-fitted tyres, front and back had to be replaced at the same time and were still legal. I am told this is a lot, some more progressive riders do not achieve half of that distance. I believe its not about speed but style, and Sergio Perez in his F1 Sauber demontsrates how tyres can be treated gently while still being fast. How I do it? No idea. But for 35,000 miles in 3 years white wall tyres are absolutely useless, as after 3,000 miles you clean them for the first time, after 9,000 miles and 3 cleans you give up, and after 20,000 miles you like the dark grey walled tyres and decide that your next set will be a plain black. They may look less classic, but definitively cleaner. 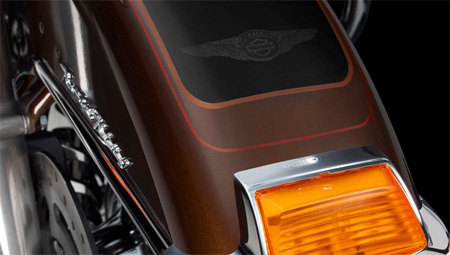 So in the UK and Europe, there are more then 1 reason to go for the 2013 Road King 110th Anniversary Edition. Colours? Actually, there is just on scheme: ANNIVERSARY VINTAGE BRONZE with ANNIVERSARY VINTAGE BLACK. My 2010 Road King Classic has now 33.000 miles, a trusted companion who never let me down, who travelled with me all corners of Europa, from the northerly tip of Scotland, to the far southwest of Portugal and the east in Croatia, come rain or shine. 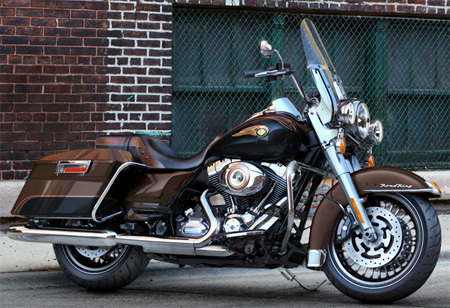 But it may be time to look at the new boy on the block, the 2013 Road King 110th Anniversary Edition. 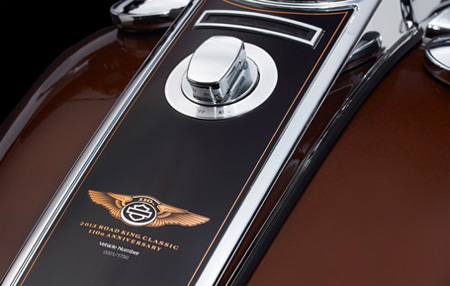 The key elements of Anniversary Editions are their unique colour scheme and some special badges. I am usually sceptical on anniversary models, as the colour scheme is not always to my taste, and if you change it, gone is the mint “Limited Edition” resale value. For me a Harley can be any colour, as long as it is black, but with age comes tolerance, and the 2013 colours seem really nice and still dark… as far as I can see. But how far can I see? For the Anniversary Editions there is one colour scheme called: Vintage BRONZE / Vintage BLACK. The “limited” nature in Anniversary Models is also one of their problems: you have to go on a blind date, you need to trust some hearsay reports and pictures on the web, as the first time you will see the the colours in the flesh is when you take delivery. Too late to turn away in disgust. 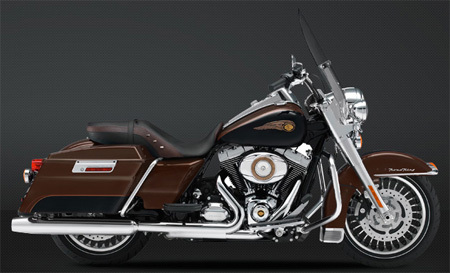 For the 2013 Road King, just 1,750 units will be build for worldwide distribution, and you need to commit even before it is build, less then 50 may hit UK roads. In a later post I will discuss other features of this Road King, like the 103 engine, the hard coloured saddlebags and cast contrast chrome wheels. The latter features are usually only sold in the US, in the UK only the Road King Classic with its black leather saddlebags and chrome laced wheels is sold. But for no, lets take a view on the colour. Black is Black, and Vivid black (my 2010 Road King) or Vintage Black for the 2013 FLHR-ANV should not be too much of a difference. But what on earth is Vintage Bronze? Accurate Colour reproduction is practically impossible, one can (expensively) calibrate his PC screen so one colour always looks the same, but who has? And then, each pair of eye relates colours differently to individual brains, remember, colour blindness is not rare, and those affected do not see in black and white, but red – brown and green spectrum is often the problematic ones. Bronze lies just in the middle, and if somebody likes the nice green of your new Anniversary bike, he is most likely colour blind. On feature shows to me in these photos, Vintage Bronze is a metallic colour that will change in different lightnings and angle of view, moving from a reddish in sunshine, through chocolate on a cloudy day, down to a pale dark brown at dawn. I like it, the deal is agreed, deposit is payed, allocation of one of the 1,750 units confirmed, now I am waiting for my second Road King, the 2013 Road King 110th Anniversary Edition. Loud pipes save lives! I believe this strongly, and have written a couple of times on the subject, and I went as far as sewing a patch with these words on my cut. Like zillion other bikers I guess. But loud pipes can also kill all fun we have, and I do not mean extremly loud pipes that give you a headache after some hours. No, the fun is killed by eager law enforcement officers, who – for whatever reason motivates them-, do what they are allowed to do, enforce a law some politicians drew up on their desk to please their electors in hope of reelection. With european harmonisation, a concerted effort by Brussels to remove all elements of fun and risk from our lives, the laws harmonise to the smallest denominator, that is never a compromise, but goes right down to the strictest values of limits. And to remain “important” politicians, they periodically review these limits, and adjust them to even stricter values. Its a vicious circle. 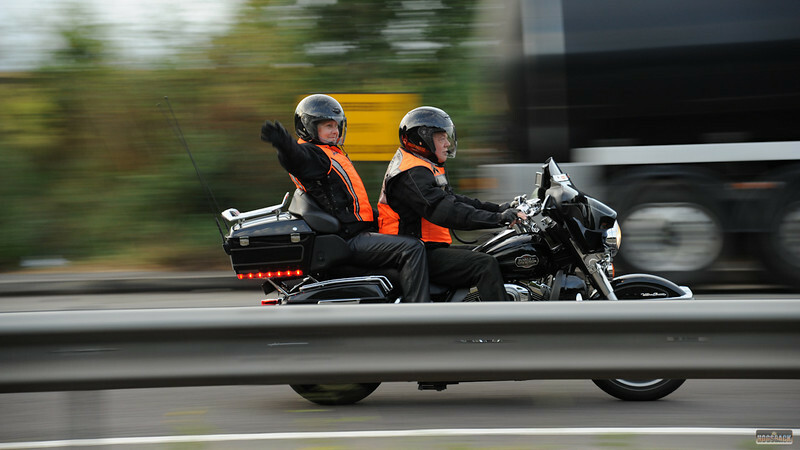 There is no legal noise limit for motorcycles (plural), there are individual noise limits for each bike, which are different from bike to bike, from car to car, and they are written in the individual registartion documents. They are even glued as a stickler on to the frame of our Harleys for everybody (and the police) to see. 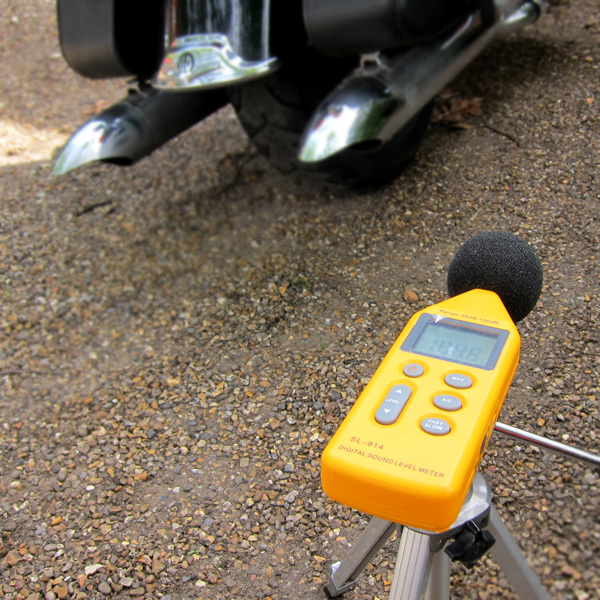 Check this out: my 2011 Sportser 883R can be as loud as 96dB(A) at 2,985rpm, while, my 2010 Road King Classic may only produce 86 dB(A). Knowing that a increase of 10dB is a doubling of volume, it remains a mistery to me why Harley registered my Road King with 86dB, while the Sportser can pass with 96. More worrying, the bikes of Chapter friends on other 96ci V2s show usually 93-94 dB, not my meager 86. I would appreciate if Harley-Davidson does us all a favour and homologises our bikes to the highest value possible, as this will make it much easier in our individual “negotiations” with law enforcement around. And it just does not make any sense that some 96ci engines are limited to 86 dB(A), while other can go up to 93-94 dB(A). But the hard fact remains: if you create a noise louder then these levels printed on your bike or your papers, your bike does not comply with its registration document and has to be removed from the road. There are 2 factors that can influence your future on the road: a) can the actual noise your pipes make be accurately measured, and b): is the cop in front of you a nice cop. Now be careful: if you disagree with the measurement, the friendly policeman will most likely agree with you, and remove your pipes as evidence for scientific testing in a laboratory with lots of white coat scientists. Remember, you just committed mass murder, bombed parliament and stole half the gold reserves of his country. Now you have no bike and no pipes and it all starts to be really expensive. My advise is trying to be a very nice biker to a hopefully nice cop, and agree on some compromise. Maybe you were in a group and others are louder, and he is happy with a couple of scalps for his belt only. In any case, try to keep your calm and agree of getting your bike towed to the next dealership for correction of the problem, best with its pipes still attached so they can be modified.